Draft: 2013, Colorado Rockies, 4th rd. In 2017 was an MiLB.com Rockies Organization All-Star...in 2016 was a mid-season Pacific Coast League All-Star...in 2015 was an MiLB.com Rockies Organization All-Star, a California League All-Star and a Baseball America High Class A and Minor League All-Star...was a Minor League Player of the Week 4 times, once each in the South Atlantic League and California League and twice in the Pacific Coast League...made all 10 of his Major League apps in September 2016 for the Rockies...was recalled for one day in 2017, on 6/7, but did not play. Played 3 sports at Baker High School in Mobile, AL...attended the University of South Alabama, where as a junior he was Sun Belt Conference Player of the Year...follow on Twitter @JPatterson1521. In his third straight season at Class AAA Albuquerque, with 26 HR ranked T3rd in the Pacific Coast League and fourth among all Rockies minor league batters...on 11/26 was claimed off waivers by the Mets...3 days later was claimed off waivers by the Reds...on 11/30 became a free agent after he was non-tendered by the Reds, but that same day was re-signed to a minor league contract with an invitation to 2019 Major League spring training camp. Played in a career-high 131 games with Triple-A Albuquerque and was named a MiLB.com Organization All-Star ... Recalled by the Rockies for one day on June 7, but did not make an appearance ... Became the fourth Isotope to receive multiple Player of the Week Awards (June 25 and July 16) in the same season … Ryan McMahon became the fifth player later in the season ... Recorded career highs in home runs (26) and RBI (92), which also led the team … his 262 total bases led the team and were ranked third in the Pacific Coast League ... Hit .283 (137-for-484) on the season with a .348 on-base percentage and a .539 slugging percentage … in the month of July batted .381 (43-for-113) with nine home runs and 24 RBI in 29 games ... Recorded four multi-home run games, which are tied for the most in a single season in Isotopes history (four times, last: Dallas McPherson, 2008). Played the entire season at Triple-A Albuquerque before his contact was purchased in September, making his Major League debut on Sept. 8 at San Diego … entered the game in right field and later walked in his first big league plate appearance...Played in 10 games, going 8-for-18 with one double and two RBI … collected his first Major League hit on Sept. 21 vs. St. Louis in an 11-1 win in the second inning off Luke Weaver...Had two RBI on Oct. 2 vs. Milwaukee in one of his three starts during September...Played right field, left and first base … started twice at first base, once in left field...Went 3-for-5 in consecutive starts at first base vs. the Brewers Oct. 1 and Oct. 2 at Coors Field … doubled on Oct. 2...Went to Spring Training with the Major League team for the first time...Hit .316 (75-for-237) with 15 doubles, five triples, four homers and 34 RBI over the first half of the season with Albuquerque...Batted .340 (70-for-206) in 60 home games for the Isotopes … overall, hit .293 (125-for-427) with 24 doubles, seven triples, 14 homers and 61 RBI in 119 games … played first base, right field and started as the DH...Hit .329 (24-for-73) in 22 games in April for Albuquerque … had four doubles, a triple, one homer and 18 RBI … batted .375 in June, going 21-for-56 in 17 games..Hit .324 (34-for-105) in 26 games in July with five homers and 18 RBI … also had five home runs and 12 RBI in August...Had a season-high 10-game hitting streak April 10-19 … hit safely in 12 of first 13 games of the season. Set career highs in nearly every offensive category, splitting time between High-A Modesto and Double-A New Britain ... Led the California League in triples, despite being promoted to New Britain midway through the season ... Named a California League Mid-Season All-Star with Modesto, a Baseball America Minor League All-Star and a Baseball America High Class-A All-Star ... Began July by collecting six multi-hits games in 10 contests before promotion July 15 to New Britain ... Started his Double-A career by hitting .375 (18-for-48) in 14 July games … had seven multi-hit games in nine contests during the month (.471; 16-for-34), including five straight July 21-26 (.579; 11-for-19) ... Played in 17 games for the Salt River Rafters in the Arizona Fall League (.157; 8-for-51), collecting two doubles, three runs, two RBI and nine walks. Spent the entire season with Low-A Asheville as the team's starting right fielder for the eventual South Atlantic League champions ... Hit .407 (37-for-91) in 25 games in June, including a 5-for-6 effort on June 7 … finished the month by going 15-for-24 (.625) the last six games ... In addition to playing right, spent time at first base and as the designated hitter ... Batted .333 (9-for-27) in seven playoffs games … had two doubles, one triple, two homers and four RBI. Spent his first professional season with the Rookie-Level Grand Junction Rockies and started 58 of his 60 games played ... Hit safely in his first five, 13 of his first 14, 16 of his first 18 and 17 of his first 20 professional games … batted a combined .303 (33-for-109) in June and July … was third on the team with 102 total bases ... Batted .375 (3-for-8) in the Pioneer League playoffs. April 1, 2019 RF Jordan Patterson assigned to Buffalo Bisons. 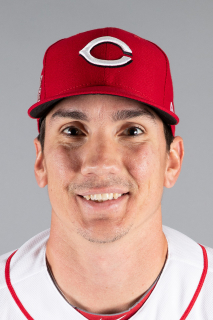 March 26, 2019 Cincinnati Reds traded RF Jordan Patterson to Toronto Blue Jays. January 9, 2019 RF Jordan Patterson assigned to Louisville Bats. December 1, 2018 Cincinnati Reds signed free agent RF Jordan Patterson to a minor league contract and invited him to spring training. November 30, 2018 1B Jordan Patterson elected free agency. November 29, 2018 Cincinnati Reds claimed 1B Jordan Patterson off waivers from New York Mets. November 26, 2018 New York Mets claimed 1B Jordan Patterson off waivers from Colorado Rockies. November 20, 2018 Colorado Rockies designated 1B Jordan Patterson for assignment. July 10, 2018 Colorado Rockies optioned 1B Jordan Patterson to Albuquerque Isotopes. July 7, 2018 Colorado Rockies recalled Jordan Patterson from Albuquerque Isotopes. May 31, 2018 Albuquerque Isotopes activated 1B Jordan Patterson from the 7-day disabled list. May 24, 2018 Albuquerque Isotopes placed 1B Jordan Patterson on the 7-day disabled list retroactive to May 22, 2018. March 20, 2018 Colorado Rockies optioned 1B Jordan Patterson to Albuquerque Isotopes. October 5, 2017 Jordan Patterson roster status changed by Colorado Rockies. October 4, 2017 Colorado Rockies reassigned 1B Jordan Patterson to the minor leagues. October 2, 2017 Colorado Rockies recalled 1B Jordan Patterson from Albuquerque Isotopes. June 8, 2017 Colorado Rockies optioned 1B Jordan Patterson to Albuquerque Isotopes. June 7, 2017 Colorado Rockies recalled Jordan Patterson from Albuquerque Isotopes. March 31, 2017 Colorado Rockies optioned RF Jordan Patterson to Albuquerque Isotopes. March 30, 2017 Colorado Rockies optioned Jordan Patterson to Albuquerque Isotopes. September 6, 2016 Colorado Rockies selected the contract of Jordan Patterson from Albuquerque Isotopes. April 3, 2016 RF Jordan Patterson assigned to Albuquerque Isotopes from Hartford Yard Goats. February 11, 2016 Colorado Rockies invited non-roster RF Jordan Patterson to spring training. July 15, 2015 RF Jordan Patterson assigned to New Britain Rock Cats from Modesto Nuts. May 14, 2015 Modesto Nuts activated RF Jordan Patterson from the 7-day disabled list. May 8, 2015 RF Jordan Patterson assigned to Modesto Nuts. April 4, 2015 RF Jordan Patterson assigned to Modesto Nuts from Asheville Tourists. April 4, 2015 Modesto Nuts activated RF Jordan Patterson. March 10, 2015 RF Jordan Patterson assigned to Colorado Rockies. March 31, 2014 RF Jordan Patterson assigned to Asheville Tourists from Grand Junction Rockies. June 19, 2013 OF Jordan Patterson assigned to Grand Junction Rockies. June 18, 2013 Colorado Rockies signed OF Jordan Patterson.